Sometimes it is oh so hard to live in Texas. I was dismayed to hear that some of our legislators were proposing we stop observing Daylight Savings Time. And even more dismayed (yet not surprised) to see my next-door cube mate had posted a difficult-to-interpret poster advocating dropping it. It’s not that I’m in love with Daylight Savings Time. I’m not sure I care one way or the other, really. I love gaining an hour in the Fall and I hate losing one in the Spring. I don’t find it cumbersome to change the handful of clocks I have that don’t already do it automatically. Yet I don’t think I’d particularly notice or mind if we stopped. What I do have a problem with, though, is being different from the rest of the country. Right now, I’m in the same time zone as the rest of my family, save a handful that are in Mountain Time. It’s simple. But if Texas drops out of DST, then I have to think about whether the rest of the country is in it and adjust my understanding of what time it is there accordingly. Now, Texans seem to like to be fairly insular so maybe a lot of them don’t interact with people from other states – I don’t know. I, for one, would find it a much heavier burden to remember the temporary time shift between Texas and Oklahoma for part of the year than I do taking a few minutes two days out of the year to change my clocks. I had hoped the measure would fail, but suspected it would succeed. Texas politicians do crazy things all the time. I was elated to find out a couple of months ago that the measure had collapsed. But shocked and deeply embarrassed about why. Proponents for the change had argued about the (in my opinion faulty) burden of changing the clocks. They had also made a slightly more reasonable argument about the safety issue that had children walking to school in the dark. The opponents’ response to the risk of children getting hit by cars that can’t see them? That’s right. Church start times wouldn’t change if we no longer went to DST. But the NFL schedule would stick to the national concept of time, not Texas’s. The result? For a handful of Sundays in the Fall, people without DVRs and/or without the ability to avoid media until they got home would have to choose between God and Football. And that choice is apparently a difficult one to make. And not just a difficult one, but one best avoided. This reminded me of conversations I’ve had with (typically older) fellow Christians who bemoan the loss of blue laws or other evidence that we are a “Christian Nation”. They’ll shake their heads that sports leagues schedule games on Sundays, that schools schedule events on Wednesday nights. They laud Chick-fil-a for being closed on Sundays. Yet they go out to eat on Sundays at other restaurants. They take care of their grocery shopping. They maybe even catch their grandchild’s game. Because, well, they don’t want to miss it. Or they don’t feel like fixing lunch. Or they really need to pick up some bread and milk. Part of the angst about the loss of a Christian face to our society is fear that the country as a whole is moving away from God. But I think another part – quite possibly a bigger, but not thought about part – is that it exposes how far we are from how we’d like to be. How we think we should be. How we think God wants us to be. Consider this. If sports leagues never schedule games on Sundays, then there is no conflict. There is no choice to be made. You never have to decide between church and your kid’s baseball game. You can live your wholesome Christian life without ever being challenged. Without sacrifice. In today’s environment, however, you have to make that choice. You paid all that money for your child to play in the select league. The team is depending on her. Do you tell the coach she won’t play in any Sunday tournaments? You see, Seventh Day Adventists and Jewish worshipers have been making these difficult decisions for decades. Why shouldn’t we share the burden? Why shouldn’t we take the opportunity to examine our faith and our priorities and how we live out our life? Why do we want society to enforce it for us so we don’t have to sacrifice? What does that say about us? Seriously. It’s a standing joke that football is as big as God in Texas. But it’s just a joke. Or, at least… it’s supposed to be. Being home alone is an interesting experience. When you are used to having a houseful, it’s actually kind of depressing and lonely. People thought I’d enjoy it – find it peaceful. But I haven’t. I enjoyed the week before when the kids were gone to camp and it was just me and the hubby. I took the week off work and got a lot done around the house. He wasn’t there all the time so I still spent a lot of time alone, but I wasn’t lonely. This past week, however, has been a little depressing. My husband took the kids to see grandparents and I went back to work. I worked long hours too. I mean, why not? What was waiting for me at home? The dog? Going to bed the first night, pulling the door closed behind me for no reason beyond habit and a theoretical fire block if the house caught on fire, I actually felt just a little bit scared. I got over it and slept so soundly that I had aches the next morning from not moving. I went to work each morning and had a couple of meetings at church in the evenings. I saw people. I spoke to people. But then I’d come home and feel like doing nothing. Sometimes it felt like I was just waiting until an appropriate time to go to bed. Most evenings consisted of having a glass of wine with dinner while watching an episode of Firefly. I was enjoying myself, but people were missing and I was feeling it. There was simply no action. No energy. No life. No spark. The last night, I had worked eleven hours, gotten off work about 8pm, and picked up some McDonald’s for dinner. That was another thing – it was hard to work up any interest in cooking for myself. I had a lot of salads and sandwiches and by Thursday night, I was tired of salads and sandwiches. McDonald’s was on the way home. I sat down with my McDonald’s and my glass of wine (that makes the meal classy, right? It was even sparkling wine). Sat down on the couch and started up another episode of Firefly. About halfway through the episode, I started getting the loading screen every few minutes. At one point I decided to pause it, let it buffer, and try to get something done so I’d be ready for bed when the show was over. Ah, yes, I thought to myself. I need to unload the dishwasher and get the dirty dishes in there. Can’t have the counter cluttered when the kids get home. That would undermine all my efforts to get them to stay on top of the dishes. So I headed into the kitchen, grabbed the silverware out of the already-open dishwasher, and turned around to the silverware drawer. In one quick and practiced motion, I opened the drawer and prepared to drop the forks and spoons in their proper places, already turning my attention back to the next item in the dishwasher. But something wasn’t right. Something didn’t compute. The drawer was not as I had left it. And since there was no one there but me and the dog, and the dog has not yet mastered the ability to pull open drawers, this took me by surprise. And then my mind interpreted more clearly what the not-quite-right situation was with the silverware drawer. And I shrieked and moved quickly back to the living room. Where the dog slowly raised her head to inquire if she should be concerned about whatever had just happened. I’m actually proud to say it wasn’t quite a shriek. More of an exclamation of surprise, tinged with maybe just a hint of panic. My voice stayed in its usual octave. The noise was brief. If it had been anything more, the dog would have come running to take down whatever had scared her mama. I’m not sure this would have been a good thing. I grabbed my phone off the couch, as all good first world people of the social media age would do, and creeped back into the kitchen. Where I got a better look at the snake hanging out on my tablespoons. A couple of quick shots and I was back in the living room, sending it first to my husband, then posting it on Facebook, then sending it to my daughter, who is the usual putter-away of dishes. She promptly submitted her resignation. My husband said he wished he had been there to witness my reaction. Which just highlighted my on-my-ownness even more. In normal times, Jane would have been putting away the dishes. She would have shrieked much more satisfactorily than I would have. She would have run into wherever we were and breathlessly told us there was a snake in the kitchen. The boys would have yelled “cool!” and dropped their electronic devices to go check it out. The dog would have hurried to see the cause of all the excitement. There would have been a crowd in the kitchen. I would have laughed at Jane, secretly relieved that it hadn’t been me, and I would have suggested that my husband relocate the snake to the outdoors. But there was no husband. No Jane. No eager boys. Not even a curious dog. Just a lazy, I-slept-all-day-in-my-crate-and-now-I’ll-lay-here-on-the-couch-while-you-have-a-silent-heart-attack-and-die dog. And a snake. In my silverware drawer. I think I’m a tougher woman than most. I’ve done a lot of things that many women wouldn’t do. I’ve ridden a kayak down a fourteen foot waterfall by myself. I’ve gone on rigorous backpacking trips. I played roller hockey, even acquired stitches on my face and a chipped tooth. I experienced natural childbirth – three times! And one of them a home birth. I participated in a rock climbing competition just 10 days after my third child was born. I’ve done stuff. I’m tough. Critters in my house, especially of the slithering variety, are not in that subset of situations. So I stood in the living room, trying to imagine myself coaxing the snake onto a long stick and taking it out the front door. The image turned into the snake deftly and swiftly traveling up the stick and leaping onto my face. I calmly revised the image back to the snake wrapped around the stick. Then the dog entered the image and attacked the snake on the stick. The snake fought back. A war ensued. I forced the mental image back to a stick with a snake traveling out the front door. But the dog was a real concern. Lock her up in a bedroom? Just how long should the stick be? Open the front door first? How many bugs will come in the house before I get the snake on the stick and out the door? 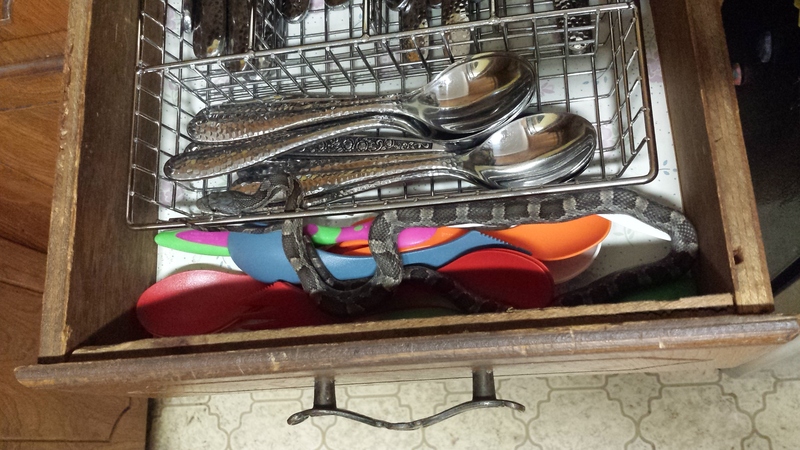 Do I really care about mosquitoes when there’s a snake in my silverware drawer? I decided to go check on the snake again. I was actually relieved. I didn’t have to worry about being brave enough to move the snake. I would have done it. Of course, I would have. I’m tough. I do what needs to be done. I totally would have taken care of the snake. But now it’s back in the walls, hopefully eating mice and bugs and being useful to us. I’m good. And then the Facebook friends started talking about it maybe being a copperhead. And I started imagining it stalking me once I went to bed for the night. My skin crawled. I told my tough (remember how tough you are?!) self that I was being silly. Cooler heads prevailed on Facebook and I employed my Google-fu to confirm that the snake was not a copperhead. I finished watching Firefly. I finished putting the dishes away – including the silverware and the stuff that goes in the drawer below the silverware. I went to bed. I swear this stuff only happens when my husband isn’t home. A friend of mine shared this article on Facebook recently. It lamented women’s patterns of speech being constantly policed and pathologized (as she put it). It mostly focused on a recent researcher’s assertion that women use ‘just’ too much and sound like they are apologizing. It mentioned other (stereotypical) women’s habits too, like our voices rising at the ends of statements, sounding hesitant, and “vocal fry” (creaky voice). I thought about how I’ve dismissed women speakers for sounding too young or hesitant for some of the reasons stated. And I’ve acknowledged that perhaps it isn’t fair. But I couldn’t help but feel there’s a balance to be struck here. Are those (negative) judgments about women based on their speech unfair? Yes! Are they because our male-dominated culture makes male speech patterns ‘the’ way? Yes! Is it going to change overnight? No! So what is an individual woman supposed to do about it? Is it easier to stop uptalk (voice rising at the end of a phrase) or is it easier to change the entire culture? Does an individual woman make the deliberate decision to possibly negatively impact her career in order to “fight the good fight” and hope to change society? I don’t know. I suppose each woman has to decide for herself. The other thing that struck me about the article was that women aren’t the only people with this problem. People with stereotypical ‘black’ patterns of speech have it too. And people with strong Southern accents (‘rednecks’). It’s not just men that define “proper speech”. It’s also white people and Northerners. Don’t believe me? How many versions of this have you seen? Funny thing about these things is that it’s always a white person ‘asking’ for the clarification. Now, don’t get me wrong. There aren’t too many people that are more committed grammar freaks than me, but this isn’t so much about grammar as it is dialect. When I speak, you can’t tell the difference between when I say ‘pen’ and when I say ‘pin’ unless I’m concentrating very hard to make the ‘e’ sound in pen. If I drop into my usual patterns of speech, they will both sound like ‘pin’. I also had a British person tell me that ‘Jenny’ and ‘Ginny’ are pronounced differently – I didn’t believe her. I seriously did not know until I was in my thirties that those sounds were supposed to be pronounced differently. Back to ‘axe’. 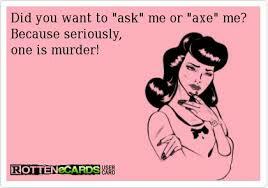 I once had a black co-worker who said ‘axe’ instead of ‘ask’. It drove me crazy. But he was a bright, masters-level educated engineer who did his job extremely well. So why knock that verbal tic of his? More importantly, as this article asks, why expect him to identify with the dominant white “proper English” culture? Axe was, once upon a time, as proper as ask – even Chaucer used it. But now we associate it with the uneducated. Shame on us. Associate it with the speaker being black if you want to, but don’t assume that it means they are uneducated. (Take the time to read the article too – it’s worth it and not particularly long). Same goes for Southern accents. My daughter picked up one in preschool from her wonderfully sweet two-year-old class teacher. I fretted about it because I knew people would assume she was uneducated if she kept it through adulthood – which she hasn’t. Don’t believe me? Just watch the news channels when they interview some small town denizen of Oklahoma after a tornado rips through. “We was just sitting there on the porch when – BAM! it just tore right through my neighbor’s barn!” You are probably already laughing at what an idiot they are. Now, granted, certain phrases like “we was” typically show a lack of education or at least a lack of dedication to said education. But take away the grammar mistakes, and the accent alone probably makes you mark them lower down the IQ scale. But grammar (and pronunciation) are not the only marks of intelligence. Just take a look at my engineer co-workers. I’ve got one brilliant former co-worker who writes ‘should of’ when he means ‘should have’. Several can’t keep track of when to use (or not use) apostrophes or commas. Most use ‘I’ when they should use ‘me’ as part of a compound object of a sentence (an ironic over-correction to the use of ‘me’ for ‘I’ in the subject). Another one pronounces ‘similar’ as sim-YOU-ler. All could likely out-think me on a number of topics in a heartbeat. Their grammar is not a reflection of their education or intelligence. Most of us wouldn’t judge their intelligence based on those habits though. Because, for whatever reason, those technically inaccurate speech patterns haven’t been tagged as flawed by the mainstream. So here’s the point I want to get to. Stop judging people by their verbal habits. Those habits are ingrained in them from childhood. It won’t be easy to stop. Because your reactions are also ingrained. But try. And if you’ve got a unique or stereotyped verbal habit, like pen/pin, axe, sim-you-ler, or saying ‘just’ too much, don’t worry about it. Unless you think it’s affecting what you want to accomplish in life. Then try to change it. And don’t worry about people who tell you you shouldn’t have to change. We’ve all got to make our own way.